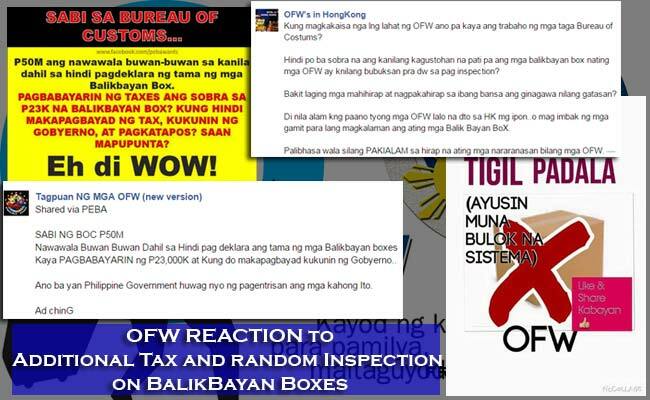 Amidst the outcry of the Overseas Filipino Workers against the impending additional tax and random inspection on BalikBayan Boxes by the Bureau of Customs, Malacañang assures the OFW’s that their packages will be respected. Many OFW’s voiced out their concerns that the inspection might be a way for some personnels of customs to snuck some valuables from the BalikBayan Boxes for selfish gains. Many had written open letters on social media sharing the pains of OFW’s just to be able to fill in a box. They admitted that it takes at least three months to half a year just to save up and buy gifts for their loved ones in the Philippines. Some OFW’s also created viral videos of their messages, explaining their dismay and reactions. Some even requested that BOC should just use scanners just like in other countries. As Abigail Valte, Deputy Presidential Spokesperson, had said in an interview with GMA news, the said process in BOC will not cause any hold ups of packages and the contents of the boxes will be respected. Valte explained that the BOC only aims to catch smugglers who uses the BalikBayan Boxes to send commercial goods in the country without paying the right taxes. BOC claims to lose around 500 thousand pesos worth of taxes every month due to these smugglers. However, OFW’s criticized the impending new guidelines, sharing their thoughts on social media that this could be a way to corrupt more tax money and steal some of the goods that are meant for their family. Senator Ferdinand ‘Bongbong’ Marcos Jr. slammed this move by the BOC saying that a BalikBayan Box is like a love letter of an OFW to his or her loved ones back home in the Philippines. Senator Marcos then challenged the BOC to defend themselves from the allegations of corruptions and show the numbers of smugglers they had put behind bars. Senator Ralph Recto also challenged the BOC to run after the big time smugglers rather than putting their focus on the balikbayan boxes. He also suggested that CCTV’s be put in the inspection areas to prove that there are no anomalies being done on the packages. If a consignee claims that something valuable was missing, then BOC can prove their innocence. Senator Recto also pointed out that if even small establishments can afford CCTV’s, BOC can also do so.